Tokyo’s Sunshine Aquarium had the feeling that potential visitors were either getting lost or simply getting distracted when on their way to the aquarium. They approached ad agency Hakuhodo to help them develop a way to guide visitors to their gates. 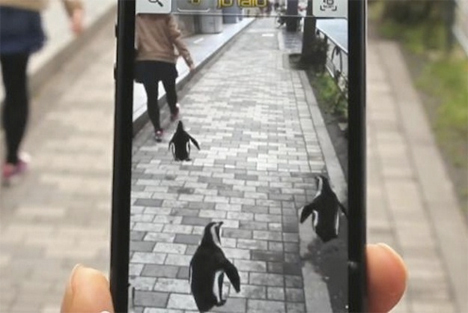 The firm came up with a unique solution: an augmented reality app that lets penguins lead the way. The closest mass transit station to Sunshine Aquarium is approximately one kilometer away. In the station, signs encourage passengers to download the app, called Penguin NAVI, via a QR code. Penguins then appear on the screen, walking in the direction of the aquarium. To get there, users simply have to follow the penguins. We can’t think of a cuter way to get around in the city. See more in Futuristic or under Technology. October, 2013.